4 bedrooms, 2 bathrooms, 8 people, new kitchen, close to beaches. Four bedroom modern villa in Collioure with heated swimming pool (13th April - 25th Oct 2019) & WiFi - about a 15 minute walk to the centre of the town, beaches, numerous restaurants and bars. 10 minute walk to a casino. Excellent views towards the hills, vineyards and Fort St Elme from the terraces. It is beautifully furnished and has three different outdoor dining areas. 2 x double bedrooms, 1 x twin/king size double and 1 x twin room. Brand new very well equipped kitchen - electric oven and induction hob, full size dishwasher, microwave, large fridge, large freezer, kettle, filter coffee maker, juicer, toaster and oyster knife! High chair and travel cot available. Spacious lounge/dining area with full length windows opening onto the front balcony and rear terraces. Dining table seats 8 people comfortably as does the wooden table outside on the terrace. UK Internet TV, DVD and CD player. Very pretty terraced garden with lockable gate to swimming pool for child safety. Washing machine in basement. Heating in all rooms. The bathroom upstairs has a walk-in shower with rain shower head, basin vanity unit and toilet. The shower room downstairs has a shower enclosure and basin. There is a separate toilet with basin next to the shower room. UK 'Freeview' channels available through internet TV. Selection of children's books and games. Selection of 60 DVD movies. 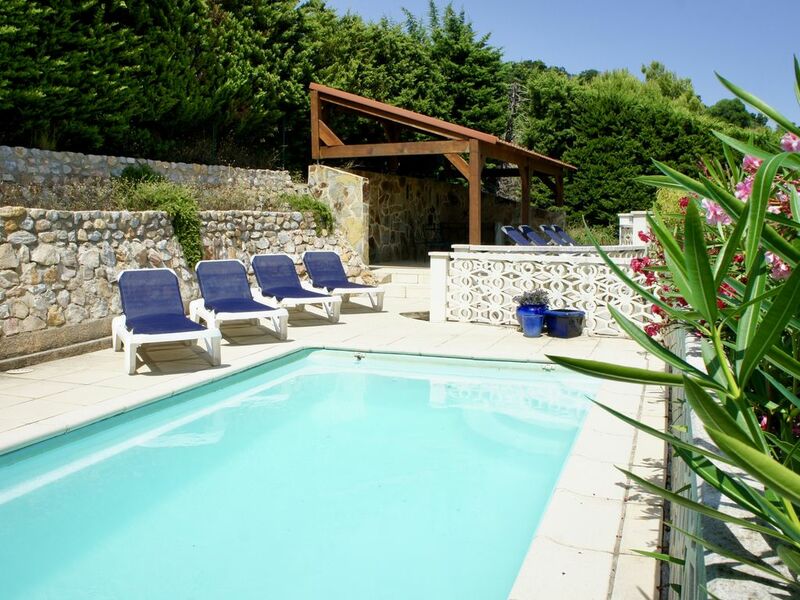 Heated swimming pool 7m x 3m (13th April - 25th October 2019). Twin room beds can be converted to a king size double bed. Outdoor table tennis table. 5 minute walk to local tennis club. 10 minute walk to Casino. Nearest golf course St Cyprien - 25 minute drive. Travel cot and high chair available. Very good, everyone did enjoy their stay. We had fantastic weather, and the house was perfect. We've rented many villas in France over the years but this was the best. The property is spacious, well equipped and comfortable. Even with 8 people it didn't feel crowded. A steep walk up the hill from the town is a small price to pay for the stunning view from the front of the house. The pool area has plenty of shade if it gets too hot and gets cleaned regularly. Air conditioning would have been a bonus but there were plenty of electric fans available. We have just had an amazing holiday in Collioure staying in Villa Derby. The house is well located and very well equipped for two families. Beds very comfortable and lovely linen. Relaxing spaces outside (3 terraces!) and another under cover, which means you can dine in different areas, retreat from the scorching sun or simply get some peace by escaping the kids! Would be sure to stay again if returning to Collioure. Five adult family members stayed at Villa Darby for a week in June. We had visited the town before on day trips and because we loved it decided to look for somewhere local to stay. Collioure did not disappoint and neither did Villa Darby. Whilst we were there the weather was extremely hot for the time of year (mid to high 30s). Villa Darby has an open air swimming pool which was very well used. In addition there were plenty of different areas of shade so everyone had their own space. Equally there was plenty of room for those who wished to soak up the sun! Whilst there we never ate inside, the outside table was large and could be shaded by the large umbrellas. The gas barbecue was easy to use, and was used a lot. By the pool there was an outdoor fridge in a bar area for those who didn't feel like walking down a few steps back to the villa. In addition there was a fully equipped table tennis table which kept players and spectators alike entertained in the cool of the evening. Suffice to say we enjoyed our stay at Villa Darby so much we are looking to return next year! We were looking for a villa and location for an extended family holiday to suit twelve year olds, twenty somethings, and those of us in our 50s and 60s. Villa Darby and Collioure really hit the spot! We felt at home in the villa from the start: the pool was a great hit as were the fabulous views from the balcony and the really well equipped kitchen. The owner was helpful and efficient when we booked and on arrival we found the description accurate and had everything we needed. The town was lovely and people were welcoming. It was lively with character, but also had the essentials - a good bakery and butcher, a small supermarket and a great choice of restaurants and bars. The young adults enjoyed a visit to the nightclub only a short walk from the villa. Collioure is a great location for exploring the area too. We particularly enjoyed the combination of mountains and sea, the stunning views along the coast into Spain and market day in Ceret. Altogether, a super summer holiday for a variety of ages and interests. Collioure, where the foothills of the Pyrenees 'kiss' the Mediterranean . This historic fishing village with 4 beaches is the 'jewel in the crown' of the region. It is surrounded by vineyards and watched over by the Church of the Notre Dame-des-Anges and the 13th century Chateau Royal. Narrow streets around the harbour are filled with bars, restaurants, galleries and boutiques. Collioure was an inspiration to the Fauvist artists such as Matisse and Derain. Local produce is available at the colourful market on Wednesday and Sunday mornings. For travel information see extra page of details.